KMOX-AM 1120 "The Voice of St. Louis"
The first time KMOX Radio Station went on the air was on Christmas Eve in 1925. It's call letters stand for "West of the Mississippi River" (K), "Missouri" (MO), and "Christmas" (X). KMOX original focus was entertainment, but in 1955 when it was apparent that Television had become the main media for entertainment, KMOX changed its format. The new format, adopted in 1955, focused on news, information, sports and community service. This format brought about change in radio programming nationwide. 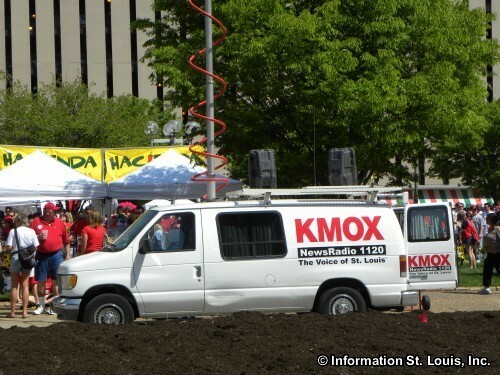 Today, KMOX is a 50,000 watt "clear channel" which allows its nightly broadcasts to be heard across much of the United States and into Canada, Mexico and the Caribbean. KMOX carries daily broadcasts of such notable talk show hosts as Rush Limbaugh, as well as local personalities. And, as of 2011, KMOX is again home to the St Louis Cardinals, much to the enjoyment of Cardinal fans across the nation!